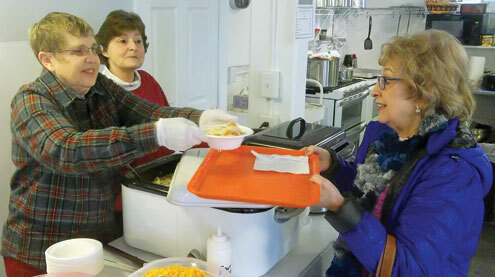 Judy Dew, left, and Penny Wombles of Clarksville United Methodist Church serve a bowl of homemade chicken noodle to Sherry McCarty during the congregation’s annual Eagle Days soup luncheon Jan. 26. Chili, hot dogs and homemade desserts also were served. Proceeds will be used to help complete the final phase of the 111-year-old church building’s Save Our Stained Glass Windows campaign. Since 2014, more than $60,000 has been raised and windows on three sides of the sanctuary have been restored. Find more Eagle Days highlights on page 14 of this week’s edition.